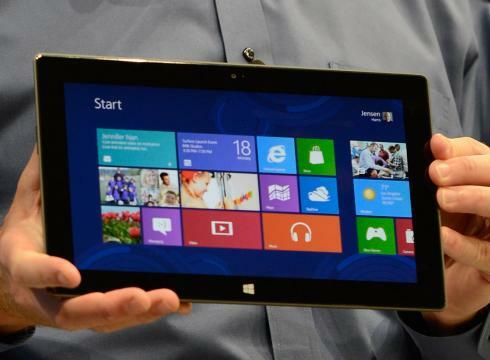 As expected , Microsoft has announced its own Microsoft-branded Windows 8 tablets. The surprise, however, is Microsoft not only announced a Windows RT tablet (the version of Windows 8 that runs on ARM-based processors) but it also announced a Windows 8 Pro tablet. 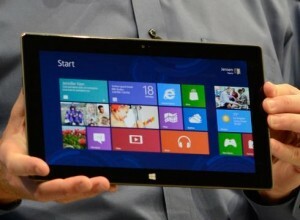 Windows 8 Pro is the ‘traditional’ version of Windows which runs on Intel chips. Windows 8 Pro, as already mentioned, is more or less the desktop version of Windows 8 Professional and is Intel-based while Windows RT is ARM-based. Windows 8 Pro will offer the full, desktop-like Windows 8 experience while Windows RT is the ‘mobile’ version of Windows 8. It is yet to be seen exactly what Windows RT offers and what it doesn’t. The Windows 8 Pro tablet packs a 10.6-inch ClearType Full HD display with Gorilla Glass, USB 3.0, dual wi-fi antennae, multi-touch keyboard, trackpad, 42 W-h battery, and a choice of either 64 GB or 128 GB of storage; with an Ivy Bridge Core i5 processor powering it. The Windows RT tablet comes with a 10.6-inch ClearType HD Display and a 31.5 W-h battery. Interestingly, it supports only USB 2.0. Other features include a choice of 32 GB or 64 GB of storage, dual-wifi antennae, multi-touch keyboard; it is powered by an ARM-based chip produced by NVIDIA. Pricing and availability is yet to be determined for either tablets; but the Windows RT tablet is likely going to be cheaper than the Windows 8 Pro tablet. I’m going to venture out and say the Windows RT tablet will probably be priced alongside iPad and Android tablets while Windows 8 Pro will likely be at least a few hundred dollars more expensive. Back when Windows 8 was just a baby it was mighty clear Microsoft was targeting the tablet market with Windows 8. With the announcement of these two new tablets Microsoft expects to give iPad and the Android tablets a run for their money. The fact that these tablets run Windows is a huge advantage, if leveraged properly by Microsoft, over rival competition because of the ability to create a harmonious ecosystem with our traditional computers. However, it is really up to the future to decide whether the Microsoft tablets will live on or die out.